The involvement of badgers Meles meles in the transmission of bovine tuberculosis (bTB) in cattle in the UK, and attempts to control the disease in cattle by killing badgers, has been among the most controversial issues in wildlife disease management globally. We reviewed the evidence, before interpreting aspects of the epizootiology of bTB in the context of badger behaviour and ecology. Specifically, our research introduced the perturbation hypothesis, and documented the individual behavioural responses of badgers in populations subjected to culling, and interpreted these in the context of a large-scale experiment, the randomized badger control trial (RBCT). The evidence for perturbation is strong, and provides both an explanation for why attempts to control bTB in cattle by killing badgers have generally been unsuccessful, and why they continue to be unpromising. We have considered alternative options, including improved biosecurity on farms and vaccination, either of cattle or badgers, and call for a more holistic approach to bTB management. Macdonald, D.W. (1984). Badgers and bovine tuberculosis – case not proven. New Scientist, 104: 17-20. Swinton, J, Tuyttens, F., Macdonald, D., Nokes, D.J., Cheeseman, C.L. and Clifton-Hadley, R. (1997). Comparison of fertility control and lethal control of bovine tuberculosis in badgers: The impact of perturbation induced transmission. Philosophical transactions of the Royal Society of London, Series B-Biological Sciences, 352: 619-631. Tuyttens, F.A.M., Macdonald, D.W., Rogers, L.M. et al. (1999). 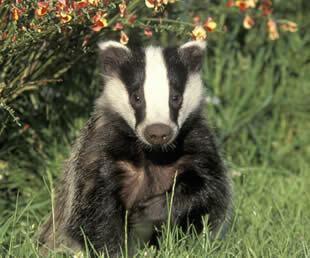 Differences in trappability of European badgers, Meles meles, in three populations in England. Journal of Applied Ecology, 36: 1051–1062. Tuyttens, F. A. M. and Macdonald, D.W. (2000). Consequences of social perturbation for wildlife management and conservation. In L M Gosling and W JSutherland, eds. Behaviour and conservation. Cambridge University Press. Tuyttens, F.A.M., Barron, L., Mallinson, P.J., Rogers, L.M. and Macdonald, D.W. (2000). Wildlife management and scientific research: a retrospective evaluation of two badger removal operations for the control of bovine tuberculosis. In H I Griffiths, ed. Mustelids in a modern world. Management and conservation aspects of small carnivore: human interactions. Leiden, Backhuys Publishers, pp. 247-265. Tuyttens, F.A.M., Delahay, R.J., Macdonald, D.W, Cheeseman, C.L., Long, B. and Donnelly, C.A. (2000). Spatial perturbation caused by a badger (Meles meles) culling operation: implications for the function of territoriality and the control of bovine tuberculosis (Mycobacterium bovis). Journal of Animal Ecology, 69: 815-828. Tuyttens, F.A.M., Macdonald, D.W., Rogers, L.M.,Cheeseman, C.L. and Roddam, A.W. (2000c). Comparative study on the consequences of culling badgers (Meles meles) on biometrics, population dynamics and movement. Journal of Animal Ecology, 69: 567-580. Tuyttens, F.A.M., Long, B., Fawcett, T. et al. (2001). Estimating group size and population density of Eurasian badgers Meles meles by quantifying latrine use. Journal of Applied Ecology, 38: 1114-1121. Macdonald, D.W., Harmsen, B.J., Johnson, P.J. and Newman, C. (2004). Increasing frequency of bite wounds with increasing population density in Eurasian badgers, Meles meles. Animal Behaviour, 67: 745-751. Macdonald, D.W., Riordan, P. and Mathews, F. (2006). Biological hurdles to the control of TB in cattle: A test of two hypotheses concerning wildlife to explain the failure of control. Biological Conservation, 131: 268-286. Mathews, F., Lovett, L., Rushton, S. and Macdonald, D.W. (2006). Bovine tuberculosis in cattle: Reduced risk on wildlife-friendly farms. Biology Letters, 2: 271-274. Mathews, F., Macdonald, D.W., Taylor, G. et al. (2006). Bovine tuberculosis (Mycobacterium bovis) in British farmland wildlife: the importance to agriculture. Proceedings of the Royal Society of London Series B, Biological Sciences, 273: 357-365. Riordan, P., Delahay, R.J., Cheeseman, C., Johnson, P.J. and Macdonald, D.W. (2011). Culling-Induced Changes in Badger (Meles meles) Behaviour, Social Organisation and the Epidemiology of Bovine Tuberculosis. Plos One, 6: 357-365.